The Handbook of Gerontology: Evidence-Based Approaches to Theory, Practice, and Policy provides an essential source of important theoretical and applied information on gerontology for all mental health professionals interested in optimizing the health and well-being of older adults. Interdisciplinary and incorporating the most current evidence-based practices in its focus, this timely book considers the many factors that affect the way this growing population experiences the world-and provides a positive and proactive guide to administering care. An exceptional resource for practitioners, researchers, policymakers, and students, the Handbook of Gerontology is essential reading for anyone who works with older adults. JAMES A. BLACKBURN, PHD, is a Professor and former Dean of the School of Social Work at Hunter College and a former Dean of the School of Social Welfare at the University of WisconsinMilwaukee. He is a member of the Gerontological Society of America, the National Council on Family Relations, the Council on Social Work Education, and the American Psychological Association. CATHERINE N. DULMUS, PHD, is Associate Professor of Social Work and Director of the Buffalo Center for Social Research at the University of Buffalo, The State University of New York. She is coeditor of several social work journals and has authored or edited a number of books, including Essentials of Child Welfare, Handbook of Preventive Interventions for Children and Adolescents, Handbook of Preventive Interventions for Adults, and The Social Work and Human Services Treatment Planner, all published by Wiley. 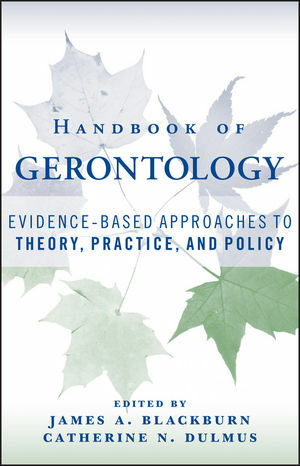 • Covers theory, practice and policy related to gerontology using a unique interdisciplinary and evidence-based focus. • Contributions are from leading researchers and clinicians in gerontology, including Waldo Klein, Nancy Kropf, Patricia Brownell, Colleen Galambos, and David Wise.